Caffeine is a central nervous system stimulant that causes dependency, but the effects are milder than with illicit drugs and alcohol. Users can have health problems and there are withdrawal symptoms when they stop taking it, but normally it does not bring direct, serious social or financial harm. The immediate effects of caffeine include increased alertness, concentration, energy, clarity and congeniality. These effects can be beneficial in some situations, such as temporary demands for increased productivity or wakefulness, provided that usage is kept within reasonable bounds. Caffeine has long been a socially accepted drug. Some caffeine-bearing products, like coffee and tea, are habitually used for pleasure and social catering. Others, like tobacco, have existed for centuries and are passed on by peers or as fashion trends. Some people use caffeinated medicines or energy drinks to ease illness and to boost performance. The problem is that your brain quickly adapts to the artificial stimulation of caffeine and stops generating some of its own chemicals. When you stop taking caffeine, the brain can not immediately restart its own natural processes, leaving you in distress. Your body also develops tolerance, meaning that, over time, you must take ever more caffeine to get the same result. These factors define addictive drugs, but most of us see caffeine as just a habit or, at worst, a quirky dependency. Moderate volumes (around 200mg), taken during the earlier part of the day, do not pose a physical threat, unless you already have high blood pressure, heart problems or anxiety. However, taking caffeine within three hours of going to bed will interfere with normal sleep to some degree. Some people are more sensitive and experience higher levels of activity when taking caffeine, often followed by extreme tiredness and heavy sleep. Caffeinated energy drinks, cool drinks and iced teas also contain a lot of sugar and this contributes to obesity as a side effect of addiction. It is a myth that caffeine helps intoxicated people to sober up or that it improve their reflexes. It does keep them awake for longer, but it has been found that caffeine actually causes more accidents if taken while under the influence of alcohol or drugs. No matter how, where or when you use it, caffeine is at least mildly addictive and, mild or not, abuse can cause problems. Lately, it has also become somewhat frowned upon by a better informed public and many users want to stop using it, but find it exceedingly hard to break free. Caffeine does not have the same chemical properties as illicit stimulants or alcohol, but it is very dangerous to take them at the same time. They all have identical, potentially fatal side-effects, like excessive pulse rate, blood pressure and dehydration, and mixing them can lead to overdosing. In fact, mixing caffeine with any drug is never a good idea, as one can never be sure of the interaction between them. Note: Some of these are available as caffeine-free or decaffeinated products under certain brand names. Caffeine-free is not the same as decaffeinated. Decaffeinated products still contain a small percentage of caffeine. Hypersensitive: People who react to small amounts of caffeine (100mg or less) with unpleasant responses like nervousness, rapid pulse and sleeplessness. Normal sensitivity: People who consume up to 400mg of caffeine per day before feeling any discomfort. They fall asleep quite easily, provided they took the last dose at least 3 hours before bedtime. Hyposensitive: A small group of people who can take very high doses (more than 400mg) of caffeine and feel almost no effect at all. They can take caffeine right before bedtime and fall asleep without a problem. First thing in the morning, some people head straight for that first cup of coffee, first cigarette or whatever their caffeine of choice may be. They are not only driven by force of habit, but also by a need to curb the withdrawal symptoms that had been building while they were sleeping. Their reward is a state of electrifying caffeine intoxication. Caffeine elevates your energy and your brain responds with pleasure signals, but it comes at a price. Although the body quickly assumes a satisfactory state of intoxication, it deflates equally fast when the caffeine wears off. Then you can expect a heavy withdrawal backlash. It can even be unpleasant while the intoxication lasts, not to mention the anxiety when you do not have your preferred source of caffeine on hand when you need it. Unpleasant withdrawal symptoms start within 12 to 24 hours after the last dosage and last up to two weeks. This is a long period of discomfort during a very sensitive stage and the main reason why users find it difficult to stop on their own. Withdrawal symptoms may only last a few days to a week for light caffeine consumers however can last two months or more for people that have been taking around 1000 mg or more daily. Even for heavy consumers of caffeine the worst of the symptoms will subside following about a week’s detox. In caffeine overdose cases patients are often administered activated charcoal, frequently used in ingested drug overdoses. The charcoal helps to prevent the caffeine from entering the stomach and gastrointestinal tract. 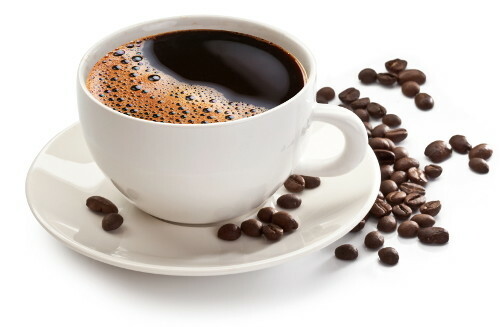 Caffeine that has already entered the patients system then may not be viable to use the charcoal and laxative or even a gastric lavage can be administered by a medical professional to expunge potentially lethal doses of caffeine. It is important to consult a medical professional as quickly as possible with any suspected overdose case. There are many other foods, beverages, and medications that surprisingly contain significant volumes of caffeine. While none of the items in the list below individually contain a lot of caffeine, used in combination with other caffeine sources they can contribute to the daily intake volume of caffeine. Here is a list of foods that contains caffeine. Know your ingredients. Understand the ingredients of the foods & drinks you consume frequently keep an eye out for caffeine products. Decrease your consumption over time. Plan to remove caffeine from your diet in stages. Caffeine is addictive and the withdraw symptoms outlined above. Water down drinks that contain caffeine. Switch to herbal tea or to decaf coffee, water or fruit juices. 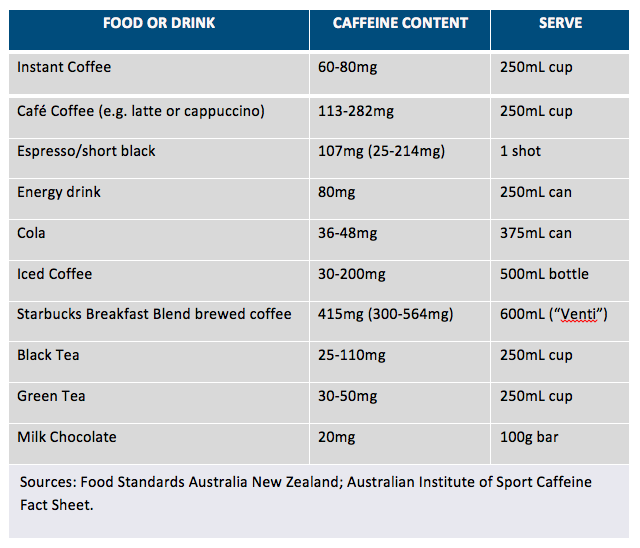 Be aware of caffeine intakes and where possible. Many over-the-counter medications, contain caffeine, switch to one that doesn’t. Do you consume more caffeinated beverages than you do water? Do you have a caffeinated beverage daily? Do you get irritable or impatient if you haven’t had your morning caffeine dose? Recovering from caffeine dependency is not as easy as most people think. Studies have found that more than 90 percent of users get caffeine withdrawals. More than 80 percent actually try to stop, but are not able to either stop or reduce it on their own. However, with professional help, you can get over it. Unlike in the past, reputable modern rehab centres are acutely aware of the complexities of caffeine addiction. They now offer advanced therapies that will enable you to overcome it, but you need to take the first step by phoning the number at the top of this page. Trained therapists are available for advice or personal interviews.